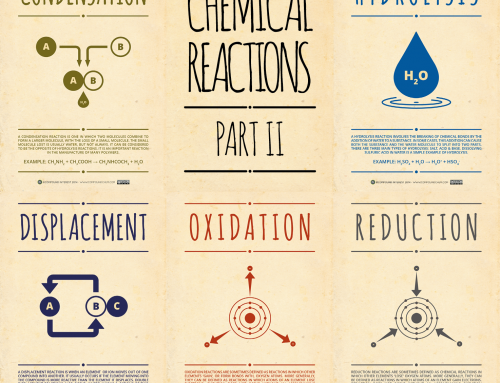 Kicking off an occasional new series of graphics with today’s post, which’ll be looking at common chemical reactions encountered in schools. 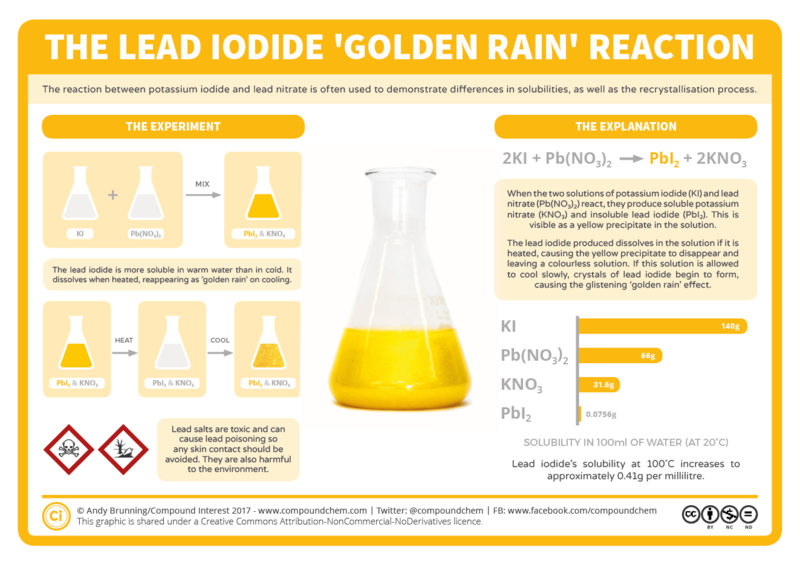 Today kicks off with one of my favourite reactions, the ‘Golden Rain’ demonstration, which involves the synthesis and recrystallisation of lead (II) iodide, and is commonly used to illustrate the recrystallisation process, as well as to demonstrate differences in solubilities. This experiment starts with two soluble ionic compounds: potassium iodide, and lead (II) nitrate. 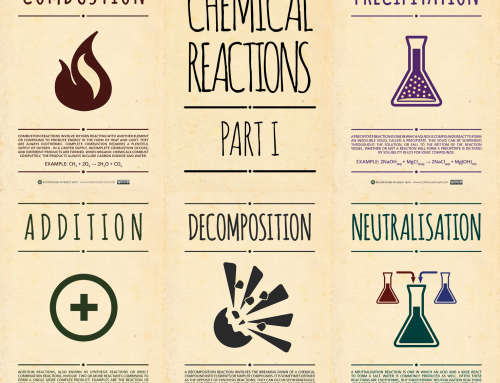 These are dissolved in water to form colourless solutions, and then mixed together. This mixing leads to a double displacement reaction, essentially resulting in the metals ‘swapping’ their places in the two compounds, producing lead (II) iodide, and potassium nitrate. It also produces a rapid colour change, as the lead iodide is very insoluble in water at room temperature. When the solutions are added together, they immediately produce a bright yellow precipitate of lead iodide. Whilst the lead iodide may be insoluble in water at room temperature, its solubility increases marginally with temperature. To put it simply, when ionic compounds dissolve in water, they dissociate into their component ions. This dissociation can either give in or take out energy from the surroundings. In the case of lead iodide, it dissociates into Pb2+ and I– ions. This takes in energy, and so increasing the temperature of the solution will promote the dissociation of lead (II) iodide. Consequently, the solubility of lead iodide rises from 0.0756 grams per 100 millilitres of water, to a dizzying 0.41 grams per 100 millilitres of water. The lead iodide dissolving produces a colourless solution once again. However, if this solution is then allowed to cool, the dropping temperature forces very pure crystals of lead iodide to precipitate back out of solution. These hexagonal crystals take some time to meander gently to the bottom of the flask, giving the reaction mixture a shimmering, glittering effect commonly referred to as a ‘golden rain’. The effect can last for up to an hour as the crystals fall out of the solution, so it’s a great experiment to instill an awe of chemistry! 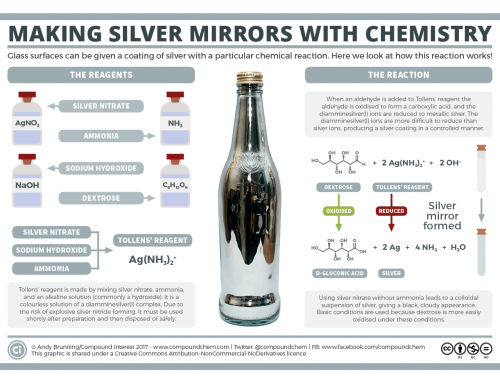 The graphic images really don’t do justice to the magnitude of the glittering effect – to get the full impact, you should check out this video by Chemistry in Context, which shows it with great clarity, and also includes some further discussion of solubility. In terms of practical uses of lead iodide, it was formerly sparingly used as an yellow paint pigment, though its instability in this form meant other pigments were generally favoured. Presently, crystals of lead iodide are sometimes used as a detector material for high energy photons. 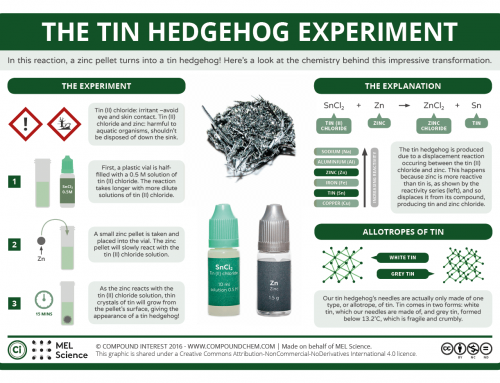 As a final point: it’s worth noting that lead compounds are toxic, and should only be used by experienced chemists or teachers with the necessary safety precautions in place.